The ProtoScript® II First Strand cDNA Synthesis Kit is optimized mix for higher specificity and yield of cDNA. ProtoScript II First Strand cDNA Synthesis Kit features two optimized mixes, ProtoScript II Enzyme Mix and ProtoScript II Reaction Mix. The enzyme mix combines ProtoScript II Reverse Transcriptase and Murine RNase Inhibitor, while the reaction mix contains dNTPs and an optimized buffer. ProtoScript II Reverse Transcriptase is a recombinant M-MuLV reverse transcriptase with reduced RNase H activity and increased thermostability. It can be used to synthesize first strand cDNA at higher temperatures than the wild type M-MuLV. The enzyme is active up to 48°C, providing higher specificity and higher yield of cDNA. The kit also provides two optimized primers for reverse transcription and nuclease-free water. An anchored Oligo-dT primer [d(T)23VN] forces the primer to anneal to the beginning of the polyA tail. The optimized Random Primer Mix provides random and consistent priming sites covering the entire RNA templates including both mRNAs and non-polyadenylated RNAs. The first strand cDNA product generated is up to 10 kb. the 1 kb Plus DNA Ladder (NEB #N3200). Ten-fold serial dilutions of in vitro transcribed luciferase RNA (1x102 to 1x109 copies) were mixed with 1 ng Jurkat total RNA. 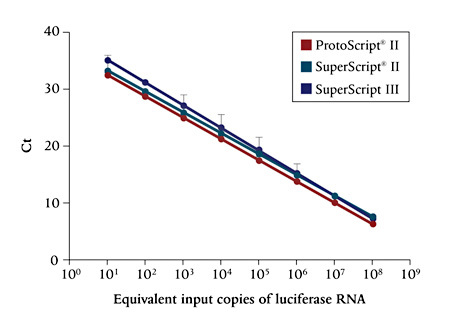 The RNA was reverse transcribed using first strand cDNA synthesis kits, as indicated, and 1/10th of the cDNA product was used for qPCR using luciferase-specific primers and iTaqTM Universal SYBR Green Supermix (BioRad). Ct values were plotted as a function of input luciferase RNA equivalent copies. Each data point represents the mean +/- 95% confidence interval of a minimum of 5 amplification reactions. ProtoScript II – NEB ProtoScript II First Strand cDNA Synthesis Kit and random primer mix; SuperScript II – Invitrogen SuperScript First Strand Synthesis System for RT-PCR and random hexamers; SuperScript® III – Invitrogen SuperScript III First Strand Synthesis SuperMix and random hexamers. Liao, J. and Gong, Z. (1997). Biotechniques. 23, 368-370. Sambrook, J. and Russel, D.W. (2001). Molecular Cloning: A Laboratory Manual, (3rd ed.),. (pp. 8.46–8.53 avnd 11.37–11.42). Cold Spring Harbor: Cold Spring Harbor Laboratory Press. What is the difference between E6560 and E6300? What is the reaction temperature for E6560? Is RNaseH treatment required before PCR amplification? Can the cDNA products be used in real-time PCR analysis? What thermostable DNA polymerase can be used for PCR after cDNA synthesis? 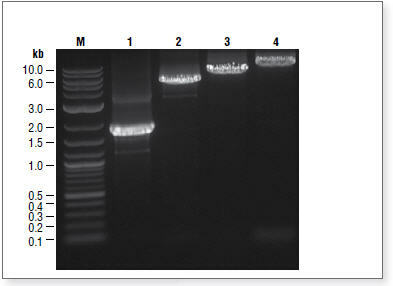 Low Yield of cDNA Check the integrity of the RNA by denaturing agarose gel electrophoresis (2). RNA should have a minimum A260/A280 ratio of 1.7 or higher. Ethanol precipitation followed by a 70% ethanol wash can remove most contaminants such as EDTA and guanidinium. Precipitation with lithium chloride can remove polysaccharides (2). Phenol/chloroform extraction and ethanol extraction can remove contaminant proteins such as proteases (2). Some target RNA may contain strong pauses for RT; Use random priming instead of d(T)23VN. Use sufficient amount of RNA.